Entergently: DIY Gourmet Candy Apples!! A couple of years ago Charlie came home from work with what looked like a candy covered soccer ball on a stick, LOL!! When I asked what it was he informed me that it was, supposedly, an apple (someone was giving them out as a promo thing). Neither of us was convinced because, I mean, it was HUGE!!! What I didn't realize was that 1/2 of that 'bulk' was candy, white chocolate and caramel. So, not convinced, we cut into it and sure enough, there was an apple in there!! With that first bite came a revelation . . . it . . . was . . . AMAZING!! and . . . . I could totally make one of these! (you can find them online and in but they are fairly expensive). I have been making them for several years, with trial and error of course. I'll share with you how I do it. It may seem complex but it is totally easy and not even very time consuming (unless you are making like 6 at a time, which I HAVE done before, LOL). I wish I would have taken pictures of all the apples I have made (some were rather impressive) but alas, I did not. But I did find a few pictures taken over the years (I included them all here). 1 large Granny Smith apple (I have tried others, and granny smith is best, but if you can't find a big one then anything that is sour or tart and crisp will work better than a more mild flavored or sweet apple). 1 stick (A regular Popsicle stick won't work, it is too small. In the past I have used large popsicle sticks, those square craft sticks, chop sticks, a couple bamboo skewers etc. You just need something that is strong enough to hold the apple when it is coated and heavy). Candy. In the past I have used reeces cups, heath bar (those 2 are the best IMO) snickers, M&M's, coconut, peanuts, raisins, sprinkles, candy canes, candy corn, pretty much anything and everything. Or you can do a 'themed' apple. 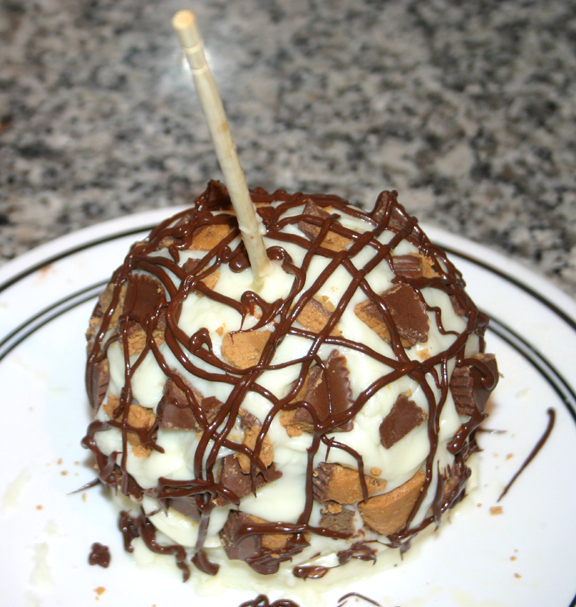 I have used chocolate, graham crackers and marshmallows for a Smores apple (seen above). I have done Trail Mix, Or you can do crushed Oreos (for dirt) and gummy worms. The options are endless!! 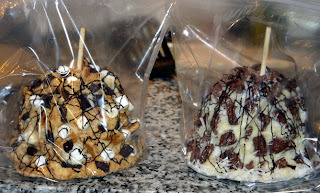 Google "gourmet candy apple" and you are sure to find plenty of sites online that sell them and there are tons of ideas! 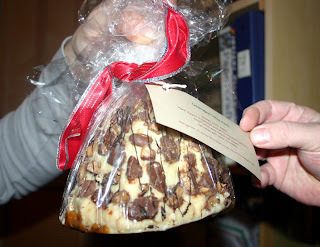 Cellophane and a ribbon - optional (for presentation if you want to impress). Start by washing your apple. This is where the baking soda comes in. Most apples have this waxy film on them that makes it harder for stuff like the caramel to stick, so I wet the apple and rub it around in my hands with some baking soda in an effort to get as much of the film off as possible. Then rinse, dry the apple and put your stick in the top. Put your caramels and water in a microwave safe bowl - 1/2 pack or 25 cubes of caramel, and 1 T of water OR 7oz of caramel with 1 T. of water. 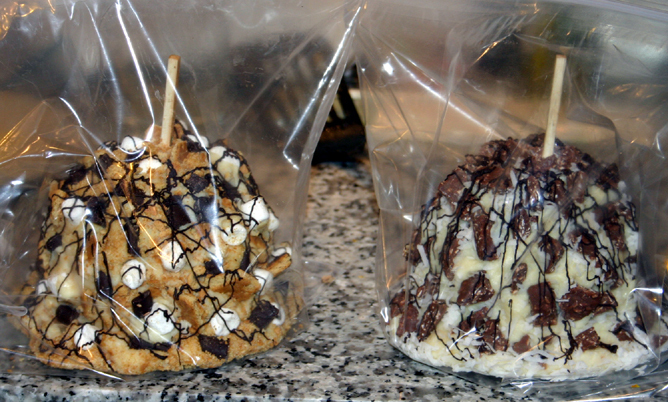 If you can't find the caramel cubes and/or don't know the weight, then just check the package of whatever you buy and see if they have recommendations for making candy apples and how much water to add. 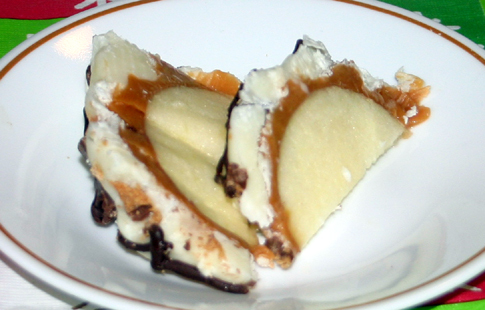 (Too little or no water makes it very hard to chew, too much water and the caramel runs off . . . ask me how I know ;-) Microwave for 30 sec, then for another 30, then stir, then keep zapping for 15 seconds till it is melted (sometimes it doesn't look melted but they will melt as you stir them up more). You may find that if you stir it enough then you only need to do it 3 or 4x. You want the caramel to be very thick, if it runs easily and quickly off the spoon it is too thin, so wait for it to cool for a minute. You want it thick because if it is too thin it will run down the apple as it is cooling and you will end up with a thin layer of caramel on top and a thick pool at the bottom. 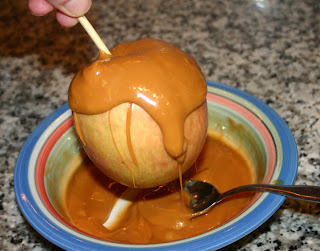 Hold the apple by the stick over the bowl of caramel and spoon it around the top of the apple, letting it run down the sides. If it is so thick that it doesn't run all the way down no problem, you can then just use the spoon to spread it around till the whole thing is covered (using all the caramel). Then I place it on a greased plate and into the fridge (or outside on the porch if it is cold). 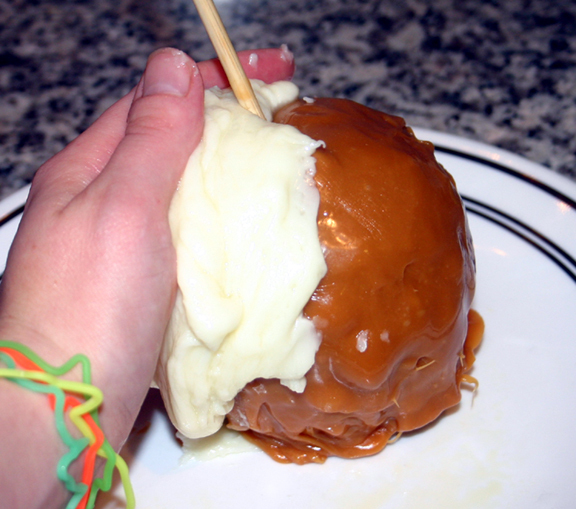 I check it after a min or so and if too much caramel has run down to the bottom I pick the apple up with my hands and mold the caramel back onto the body (making sure to get it as even on top and bottom as possible). While the apple sits in the fridge I melt the white chips (1 whole pack) on low on the stove, adding a splash of cream to them (maybe like 1T or so) which makes a ganache (this is optional). **while it is melting you can chop your candy if needed** Watch them closely, stirring occasionally (don't over stir). I like to chips to be melted but only warm to the touch. Sometimes I can catch them as they are just melted, sometimes they get too hot and I have to remove them from the heat and let them cool a bit till I can handle it. Either way, once they are cool enough that you can reach in the pot and scoop it out with your hand that should work. 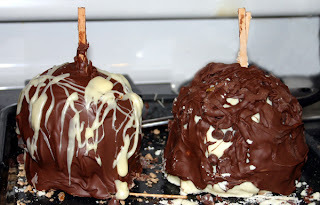 Then, I pick up the apple (you may have to use a spatula to pop it off the plate) and paste the white chocolate on with my hands till it is all on there and evenly spread. Next, while the white chocolate is still soft (but not so warm as to melt the chocolate in my candy) I take the candy and place it into the white chocolate. If you are using something like graham cracker crumbs, coconut, sprinkles, or something small, you can roll the apple around it it to coat it completely, then you want to hand place larger chunks. With cut up candy, usually I just sprinkle on the smaller pieces then I take larger chunks and piece them on. When I have all the candy on there I stick it back in the fridge. While it hardens in the fridge again, I melt a handful of chocolate chips in the microwave, pop them in a sandwich bag, snip off the end to drizzle over the top to finish it off. Then I keep it in the fridge till I am ready to serve (or take it wherever we are going). It will keep for a while, so you can make them days early if needed. To serve, cut it in triangular slices from the top center (where the stick is) kind of like you are cutting a cake. If you want it to look nice you can cut a big piece of cellophane, set the apple in the middle, gather it all at the top and tie it off (on the stick) with a ribbon. Just makes for a nice presentation, especially if you are giving it as a gift (and they make a really nice gift for Christmas, or any other special occasion). They are nice for parties, showers, or any type of get-together.